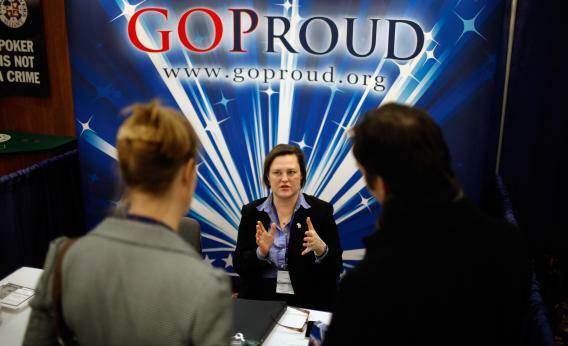 CPAC 2013: Gay Republican group members will speak at convention. Participants talk with a representatives from GOProud, an organization that represents gay conservatives and their allies, at the Conservative Political Action Conference at the Marriott Wardman Park February 11, 2011 in Washington, DC. Even after Barron apologized, the incident gave social conservatives all the oomph they needed to keep GOProud out. In 2012, GOProud endured the insult with a “Big Gay Party” off the CPAC campus, sponsored and hosted by Andrew Breitbart. But Breitbart died later that year. Gay Republicans have had to settle for schadenfreude in the form of media coverage mocking a conference that keeps gay rights off the agenda. But that changed this week. The Competitive Enterprise Institute, a D.C.-based libertarian think tank that largely focuses on economic and environmental policy, will hold a CPAC panel featuring two GOProud board members. Its cheeky title: “A Rainbow on the Right.” Get it? Get it?